Falcon SC70A Series heavy duty closers are built for busy commercial applications that demand reliable door control and easy maintenance. 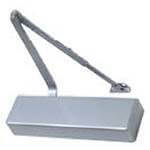 Designed for use with aluminum storefronts, SC70A Series closers are ANSI Grade 1, ADA compliant and deliver tough performance. Choose the SC70A for interior or exterior doors in retail shops, restaurants, and small offices.